The present case has been reported in the Apollo journal of case studies. A 39 year old male reported with pain in multiple joints, especially in the hip joints. He was previously fit and well. His symptoms started two years ago. Progressively his symptoms were worsening and by the time he came to OPD he was wheel-chair bound. He was initially seen by a Rheumatologist and a possible diagnosis of fibrous dysplasia was made. Symptoms were unremitting despite treatment. His SPECT -CT showed possible fracture in the hip joint and multiple epiphyseal fractures. In view of his multiple epiphyseal-fractures he was referred to the Endocrinologist to look for metabolic bone disease. A diagnosis of Osteomalacia was made and was commenced on treatment for this. After six months of different treatments his symptoms were not resolving. In view of his long history and lack of improvement, a detailed clinical work-up was done. His serum phosphate was found to be very low with an increased 24 hour urinary phosphorus excretion. This led on to further investigations which showed a normal vitamin-D and a very low 1.2 5 hydroxy vitamin D levels pointing to a rare condition called Oncogenic Osteomalacia. Serum FGF-23 (Fibroblast growth factor-23) which was 20 fold elevated confirming the diagnosis. This condition is usually due to a tiny benign bony tumor and is often difficult to locate. Usually these are found in the peripheries (feet, hands) and in the facial region (ethmoid sinus). He was evaluated by CT and MRI imaging. A small tumor in the right trochanter was located. To find out whether this was the culprit, further functional evaluation was done using FDG PET-CT and Galium-Octreotide PET-CT, both of which confirmed that this tiny tumor was metabolically very active. Based on this he was taken up for surgery after normalizing the metabolic parameters with medical treatment. On day two of the surgery, the patient noticed a remarkable improvement in his symptoms. His pain decreased by almost 80% and he started mobilising with the help of a Physiotherapist. Pathology revealed this to be an "Atypical spindle cell tumor". Unfortunately he had a relapse of the tumor later and the recurrent tumor was located just beneath the previous tumor. The histology was atypical again and he was put on long acting Octreotide injections which he is still on. 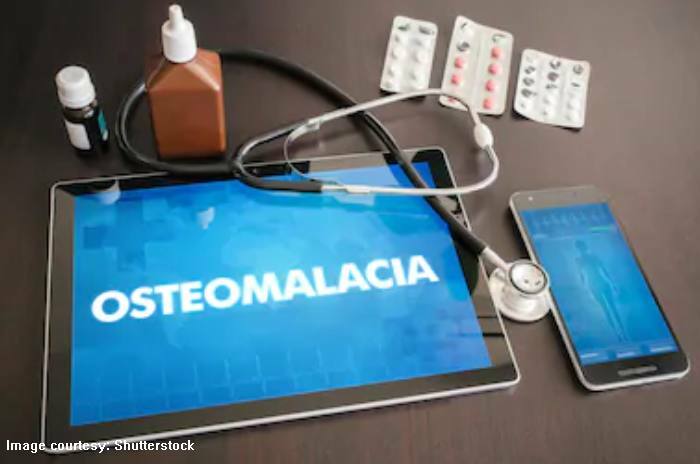 - Oncogenic Osteomalacia is a rare condition causing debilitating illness (so far about 200 reported cases). - Symptoms are non-specific and hence there is a delay in diagnosis. It requires a high index of suspicion to diagnose this. - The management, like in this case, involves multi-disciplinary inputs.